Elton John's music means a lot to me, and, as a result, I'm not overjoyed with this album. A record with a theme, it's an account, sometimes photographic, sometimes emotional, all too often metaphorical, of Elton John in America -- the madman across the water. As impressions, it's brought out the worst in Bernie Taupin and forced Elton back on his melodic devices. These are sometimes powerful enough to make a song, but too often they're not. I still like this album, but it's just that the qualities that illuminated Elton John and Tumbleweed Connection for me have worn thin, and I'm forced to look past the magic and see a singer and a lyricist who are quite fallible. The record begins well with "Tiny Dancer." It has the delicate melody, virtuoso singing, and innovative arranging that have marked Elton John since "Your Song." In fact, it sounds like "Your Song," with maybe some other familiar melody and a few new touches like a pedal steel. But that's OK; it may be the same song, but it's a good song. "Levon" stands out on the radio simply because any Elton John song would. But, here we begin to encounter a knotty problem that worsens as the album continues. I.e., what the hell is he talking about? I'm no literal-minded dullard but when someone is being obscure, I like to get the feeling that they are grappling with something that's hard to get to, not just playing with words. In many of Dylan's songs the meaning was far from clear, but you could sense there was something there. And there were phrases that shone out even if the whole didn't fall into place. I don't get that feeling here. And, from listening to the first two albums, I know that the John/Taupin songs I like best were those I understood. There was strength in those songs, even if they were elliptical. "Levon" sounds good, but I could listen to it for years and never know what it's about. And it does make a difference. With "Razor Face," the situation improves even if I haven't an idea of what that means either. It's got the same sort of far-ranging singing and pounding piano that were used so well on Tumbleweed Connection, somewhat like "Amoreena." Unfortunately, this is followed by the title cut, which is to me, also the weakest. "Madman Across The Water" pits Elton's acrobatics against Paul Buckmaster's charging strings. But, again the lyrics trip him up. The song is superficially about madness, but is filled with so many obscure images that it's only a good song if you don't listen to it too much. Side two is a little less reaching. "Indian Sunset" is a story, with good evocative singing by Elton. The subject matter -- the tragedy of the American Indian -- almost overwhelms the song, but it manages to be moving. Then, alas, comes another piece of Americana called "Holiday Inn" and about the same: "And you ain't seen nothing/Until you've been in/A motel baby/Like the Holiday Inn." I guess a banal subject deserves banal lyrics, but why bother? "Rotten Peaches" is good basic Elton with a good melody and a wall of sound that fills the room. If only I knew what rotten peaches had to do with the homesickness that seems to be the theme. It isn't until the short (1:48) closing cut, that we get a glimpse of what Elton and Bernie were. "Goodbye" is a haunting, sad song with just Elton and piano and some appropriate strings. The melody sings and the words are poetry. It's sad, but makes me all the sadder that there wasn't more like this. Madman won't really crush any John fans, for he sings with the same power and brilliance he's shown since he broke. But, it probably won't draw any either. Madman is a difficult, sometimes impossibly dense record. America is worth a better story than this record and Elton John needs a better story than this to sing. - Alec Dubro, Rolling Stone, 1-20-72. John's album has been long awaited and his two great virtues are happily here: he vocally attacks the scale as conquerer and his piano is more a drum than a drum. Among the new material by John and Bernie Taupin, "Tiny Dancer," "All the Nasties," "Goodbye," and the cryptic title song are highlights. Chart action should be immediate. Elton John's first two albums hit the mark. The songs had the unmistakeable stamp of genius, the arrangements were just about perfect and Elton's voice had the right involvement and conversely the proper detachment, when that was needed, to cast a spell. If the live LP and the Friends soundtrack were somewhat less than fantastic, they only whetted the appetite for another helping of pure and original material. Madman Across The Water should quench the thirst of those who spotted Elton "back when." But, more importantly, it should please even some of the harshest critics of the talented and precocious Mr. Dwight. There are nine songs here. At least three -- "Tiny Dancer," a haunting bouquet to lyricist Bernie Taupin's wife Maxine: "Levon," a steel-eyed glimpse of a man "born a pauper to a pawn" and a rich example of Elton's super-strong piano playing; and "Rotten Peaches," a disturbing look around at the more unsightly aspects of a prison system which claims to be reformative -- are three out and out masterpieces: excellent examples of what can happen when clear and incisive lyrics are matched by aggressive and innovative musical forms. Each of the remaining six tracks offers something of value, from the amusing though frightening title piece to "All The Nasties," in which critics are given some kind of desserts. There's even a "Goodbye," eloquent and fleeting, which closes out the album. Much credit should go to Paul Buckmaster, whose strings are present but never obtrusive. Years from now people may look back on this as the definitive Elton John album. - Ed Kelleher, Circus, 1-72. 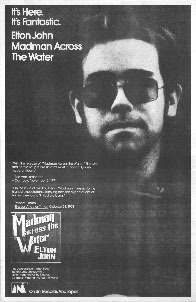 Madman Across the Water is another big Elton John-Bernie Taupin-Gus Dudgeon-Paul Buckmaster production. Sad to say, it's not nearly up to the caliber of its predecessor in this genre, Tumbleweed Connection, although there is some good music here, e.g. "Tiny Dancer" and "Levon." When they can be heard above the clamoring strings, choirs, and so forth, Elton's staccato piano and Caleb Quaye's guitar provide the bright moments. So does Davey Johnstone's mandolin on "Holiday Inn." Withal, too much overblown musical rhetoric. An unexpected early CD release, Madman was already difficult to buy in quality LP pressings, it being rumoured that Elton himself had no love for this album. What a delight -- here is the finest bunch of Taupin/John ballads ever written now freed from the constraints of vinyl. The real benefits come in the large scale numbers with Paul Buckmaster's distinctive cut-and-thrust string backings. "Tiny Dancer" now stretches out into an enourmous studio acoustic; Chris Spedding's electric guitar in the title track echoes in the vastness while the ARP synth bass now has the power to uproot. The simpler arrangements -- the drum, electric/acoustic bass, piano and choir in "Indian Sunset" for example -- have an eerie presence. Nor are the dynamics of this track to be underestimated. Probably not everyone's first thought for an Elton CD but there is little to better it. - David Prakel, Rock 'n' Roll on Compact Disc, 1987. - Bill Shapiro, Rock & Roll Review: A Guide to Good Rock on CD, 1991. - William Ruhlmann, The All-Music Guide to Rock, 1995. Elton John was so dedicated to his art, or so contractually bound, that he released five albums in 18 months from April 1970 -- although one was a movie soundtrack and another a live effort. Madman..., which started with two tracks recorded in February 1971 and was completed that August, was his fourth studio album, and included no major hit singles, yet remained in the U.S. chart for almost a year; by contrast, it was one of his least successful in the UK. It was also the first Elton album to feature Scottish guitarist Davey Johnstone (ex-Magna Carta), who became a permanent band member in early 1972, and more than 30 years later, is still in Elton's band (as is drummer Nigel Olsson). Among the session musicians helping out here are Rick Wakeman (keyboards), Herbie Flowers (bass), and Chris Spedding (guitar). Unsurprisingly, given Wakeman's involvement, there is a whiff of prog rock about the proceedings, while Paul Buckmaster's rich string arrangements serve to futher expand the sound. The best songs here are at the start: "Tiny Dancer" was written about Bernie Taupin's first wife, Maxine Feibelman, and both this and another ballad, the lyrically abstruse "Levon," were U.S. Top 40 singles -- no mean feat given their uncommercial length. Taupin has stated that the title track -- an unnerving portrait of insanity, hinting at an introspective streak which pervades much of this album -- has the dubious distinction of being his most mistunderstood lyric. Many people have presumed that it is about the disgraced U.S. president Richard Nixon. While dismissing this idea, Taupin has not provided an alternative explanation. - John Tobler, 1001 Albums You Must Hear Before You Die, 2005. Part of the magic of ballads like "Levon" and "Tiny Dancer" is the piano Elton was playing -- the legendary Bechstein grand at London's Trident Studios. It's the most famous piano in rock -- the same one heard on the Beatles' "Hey Jude" and David Bowie's "Life on Mars?" It really flatters Elton's melodies here, as he and Taupin get far-out with "Razor Face" and "Holiday Inn." So what is "Levon" about? Elton has no idea. "Part of the enjoyment and mystique of our thing is we've never collaborated," he said. "I'd never ask Bernie what it means." (For the record, Taupin swore the song had nothing to do with Levon Helm -- he just liked the name). - Rob Sheffield, Rolling Stone, 3/23/17.